A cartoon blog - strawberry dragons: Bathrooms and magic fires -the power of advertising. A little piece of domestic history. Bathrooms and magic fires -the power of advertising. A little piece of domestic history. Funny things 1990s bathrooms. Often they were the room in the house which looked least like a room you would go into to become clean. They were often damp, slightly chilly places with a touch of mould in the corners. Ours was no exception. It was, however a luxurious palace compared to our first bathroom. We rented a flat when we were first married. It was unfurnished, without anything at all in it except a gas poker to light the open fire. 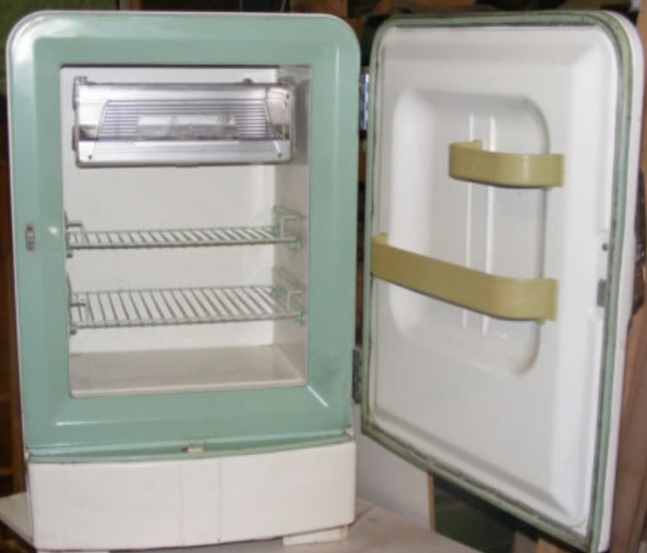 We bought the kitchen goods from a friend's granny for £5 - a lovely twin tub washing machine, a three ring cooker and a beautiful fridge. 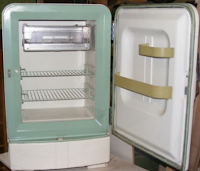 The fridge was very old even then, but it still worked as long as we turned it upside down now and again. It was a pretty green colour inside. I have always liked the 1930s look! so on cold days the toilet would freeze and the windows would have a sheet of ice inside. Jim and I used to argue heatedly (how ironic) about whose turn it was to go and light the stove in the morning. Well well! 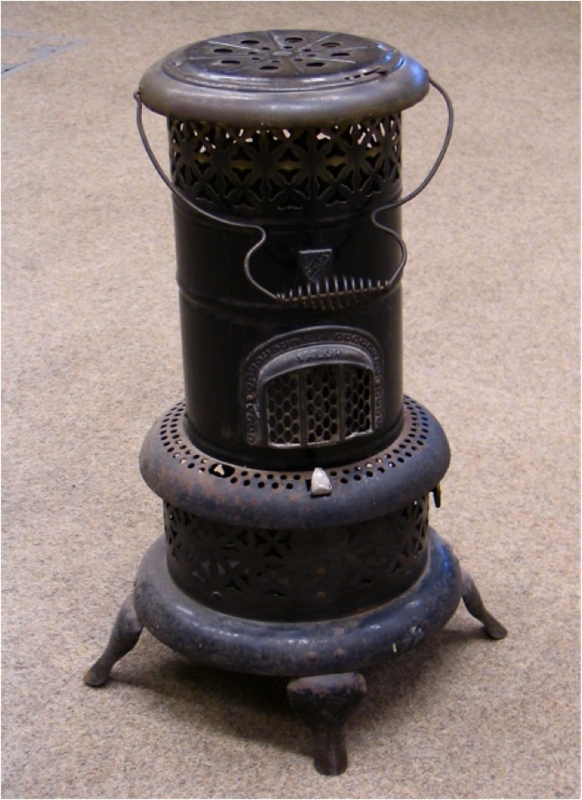 I can't imagine any of my kids wanting to start out with hand-me-down paraffin heaters, times have changed for the better I think - but enough of ancient reminiscences. Back to the future! British Coal had an advert in the mid 1980s which showed toys getting out of the toy box in the night and sitting round the fire. The advert was still in use when Sam was a child. When he saw it he was agog to see if his toys would do the same when we had a fire. 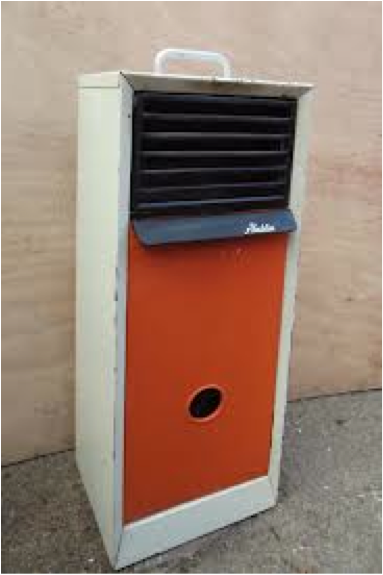 We often had one - our house was draughty and wet under the floor. I used to find slug trails on the carpet, and, on one memorable occasion in the dead of night, I trod on a live slug. Eeugh! It took me days to get the slime from between my toes. The central heating helped a lot, but a real fire in the grate just can't be beaten for comfort and toastiness. One night we succumbed to the bright idea (if such a thing is possible) of moving the toys to sit in a semicircle round the fire. Dinosaurs and trucks sat side by side with George's sword and Captain Hook puppet. Sooty and Sweep joined in as well. We went to town on it. It was a design classic. When Sam came down the next morning he couldn't believe his eyes. "My dinosaurs have been magic in the night! The swords have been fighting on their own!" George's eyes were out on stalks too. After this lapse in judgement we were forced to arrange the toys every time we had a fire for years. We used to argue about whose turn it was to do that as well!